Panasonic RP-HC101 review | What Hi-Fi? 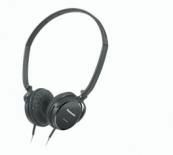 The Panasonic RP-HC101 noise-cancelling headphones are light, foldable and compact, although they don’t fit as snugly on the head as some of their rivals. Once you turn on the noise-cancelling and start playing music, however, you’re in for a pleasant surprise. There’s great definition and clarity to vocals, enjoyably punchy bass and overall they’re just fun and easy to listen to. The noise-cancelling reduces the noise of trains and traffic, but it could be a lot better. To be fair, these aren’t competing with the Award-winning Bose QuietComfort 15, but they still perform well against their peers, and we prefer them to the more portable Sennheiser PXC 250-II.